Ths cooling vest uses, as all HyperKewl cooling products, an evaporation technique. The silver cooling vest has front pockets and a zipper closure at the front. 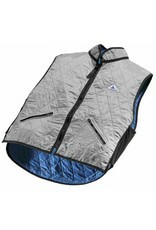 To activate the cooling vest, simply soak it for 2-3 minutes in water and gently remove access water.